Pat Collins is a well regarded media personality in New York, known for her long-time stint as a film critic on WWOR-TV, and her work as an entertainment editor and critic for Good Morning America. In the 1970s, she hosted her own show on the local CBS channel, WCBS-TV, The Pat Collins Show and invited Jim and Frank Oz to be guests for the June 20, 1974 broadcast. Jim had gotten considerable attention from the press with the airing of his Valentine Show earlier that year, and he had a deal with ABC that he hoped would lead to a series. Jim appeared on the Tonight Show the month before and his turn as the mystery guest on What’s My Line later that year makes it clear that his popularity as a talk show personality was growing. The show opened with Collins in discussion with Kermit and Cookie Monster. The next segment featured Jim and Frank on camera talking with Collins, mostly about Sesame Street. It’s not surprising that the topic of conversation was the show given its deep connection to New York. In addition, around that time, Collins had hired Sesame composer Joe Raposo to work on her show’s theme song, and a couple years later, they were married. The appearance also featured Jim performing Rowlf and Frank performing George the Janitor from the Valentine Show. Rowlf also joined Collins for an animal segment with a zookeeper from New Jersey’s Turtle Back Zoo, and the show ended with Kermit and Cookie Monster helping Collins announce local activities for kids. Over her long career, Collins’ upbeat and warm personality has helped her to build a wide range of friendships across the worlds of entertainment and journalism. Through Raposo, she became a good friend to Jim and the Sesame Street team. Given that she is the author of a book titled How To Be A Really Nice Person, Collins was certainly one of Jim’s kind of people. 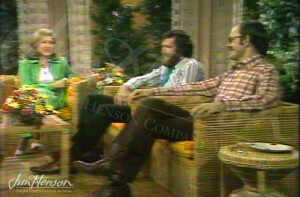 Talk show host Pat Collins with Jim and Frank Oz, 1974. Pat Collins and Rowlf with another guest, a skunk from the Turtle Back Zoo. This entry was posted in 06-June '74, 1974, Appearances and tagged CBS, Cookie Monster, Frank Oz, Joe Raposo, Kermit, New York, Pat Collins, Pat Collins Show, Sesame Street. Bookmark the permalink.